本发明公开了一种惯性导航系统两维落点精度估计方法，通过采集惯性导航系统n次导航后运载体停止的位置信息得到惯性导航纵向偏差和横向偏差的标准偏差，建立平面直角坐标系OXY，利用标准偏差建立一个椭圆，在该椭圆范围内包含了惯性导航在水平面内50％的落点。 The present invention discloses a two-dimensional estimation method of placement accuracy inertial navigation system, stop the vehicle position information obtained by the standard deviation of the longitudinal and lateral deviation of the inertial navigation deviation after n inertial navigation system to navigate through the acquisition, establishing plane rectangular coordinate system OXY , using a standard deviation of establishing an ellipse, comprising the inertial navigation placement in a horizontal plane within 50% of the ellipse. 本发明提供了一种对水平面内的惯性导航落点精度的描述方法，相对传统的圆概率误差(CEP)的描述方法，具有可得到精确表达式、准确描述落点特征的优点。 The present invention provides a description of the method of placement accuracy of the inertial horizontal plane, relative to conventional circular error probability (CEP) of the method described, has the advantage of exact expression can be obtained, and accurate placement described features. [0001 ]本发明涉及一种两维落点精度估计方法，属于惯性导航系统精度估计领域。  The present invention relates to a two-dimensional placement accuracy estimation, belongs to the field of precision inertial navigation system is estimated. 惯性导航系统的精度可用与标准误差的一致程度来表示，最常用的惯性导航系统的精度度量方法是基于二维平面的圆概率误差CEP(Circular Error Probablity)。 Accuracy  The inertial navigation system can be used with the degree of coincidence to represent the standard error, the accuracy of the measurement method most commonly used inertial navigation system is based on two-dimensional plane of the CEP CEP (Circular Error Probablity). 这种精度度量法为弹道导弹弹着点位置精度提供了一种简单的度量，它定义为围绕实际目标包含50 %的导弹弹头弹着点的圆的半径，CEP圆的圆心是实际水平面的位置。 This accuracy measurement method provides a simple measure of the accuracy of the position of the point of impact of ballistic missiles, which is defined as the actual target comprising 50% of the radius of the circle around the missile warhead point of impact, the position of the center of the circle is the actual CEP horizontal plane. 利用上式，可以在已知概率P时近似计算其对应的R值，但求解过程十分繁琐。  With the above formula, R can be approximated values ​​corresponding probability P is known, the solution process is very cumbersome. 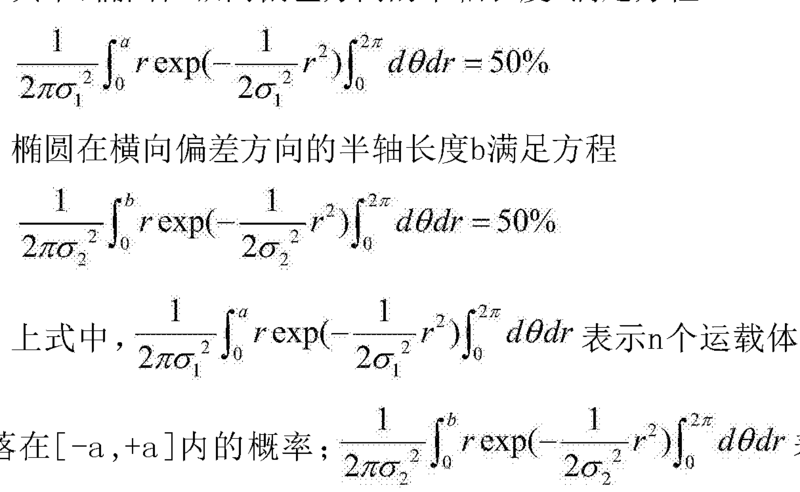 设σχ=100m、σy = 400m，则P(x2+y2〈R2)随着R的变化过程如图l所示。  provided σχ = 100m, σy = 400m, then P (x2 + y2 <R2) with R changing process shown in Figure l. 当CEP = R = 290.2m时，有P (x2+y2〈R2) = 0.5。 When CEP R = 290.2m =, there are P (x2 + y2 <R2) = 0.5. 此时，可保证50 %的弹着点在此圆内。 At this time, to ensure a 50% point of impact within this circle. 设σχ = I OOm、Oy = 400m，则模拟打靶1000次的落点分布如图2所示。  provided σχ = I OOm, Oy = 400m, the analog 1000 targeting the impact point distribution shown in Fig. 从图2可以看出，弹着点在X方向基本都小于此圆的半径，但在Y方向有大量离散点都在此圆的外部。  As can be seen from Figure 2, the point of impact in the direction X are substantially smaller than this radius of a circle, but a large number of external discrete points in the circle in the Y direction. 另外，只根据CEP值的大小不能确定X或Y轴哪个方向的密集度更大。 Further, not only the size of the CEP values ​​greater density which is determined according to the X or Y axis direction. 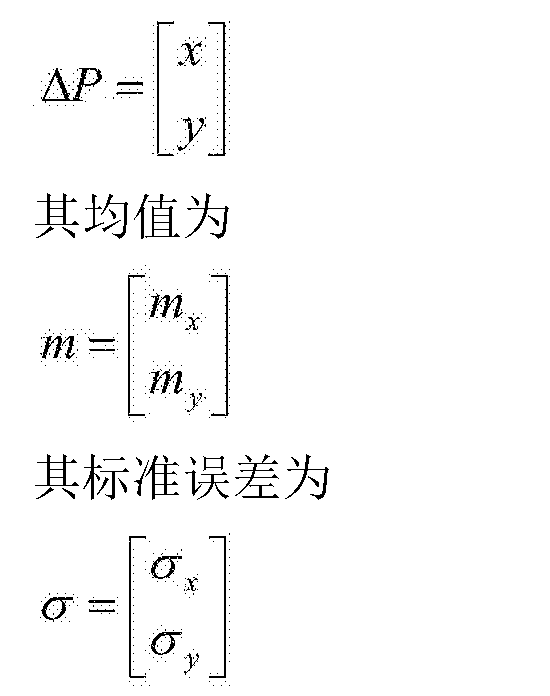 因此， CEP适合于等标准误差时的精度分析，缺少方向性。 Therefore, the accuracy and the like suitable for analysis of the standard error of the CEP, the lack of directionality. 同时，在求式（1)和式(3)的概率积分时， 没有精确的表达式，导致所得CEP值为一个近似值，而非精确结果。 Meanwhile, when the percentage value of the formula (1) and (3) integration, no precise expression, leading to an approximate value of the resulting CEP, rather than accurate results. 对于导航落点，实际落点在射击平面的投影点与目标点之间的距离称为纵向偏差;落点与射击平面间的距离称为横向偏差。  For navigation placement, the actual firing point placement between the projection plane and the target point is referred to as longitudinal offset distance; the distance between the lateral deviation referred to the impact point and the shooting plane. 本发明的技术解决问题是：克服现有技术的不足，提供一种惯性导航系统两维落点精度估计方法，既给出惯性导航两维落点精度估计的相对精确地表达式，同时能判断出弹着点在纵向偏差方向和横向偏差方向的分布特性。  The techniques of the present invention is to solve the problem: to overcome the deficiencies of the prior art by providing a two-dimensional estimation method of placement accuracy inertial navigation system, both given two-dimensional inertial navigation estimation accuracy of the impact point relatively accurately expression, while the distribution characteristics can determine the point of impact in the longitudinal direction and the lateral deviation of the direction of the deviation. (5)根据步骤(4)建立的椭圆得到该惯性导航系统两维落点精度ECEP=(a，b)，其中a和b分别为步骤(4)建立的椭圆在纵向偏差方向和横向偏差方向的半轴长度，从而完成落点精度估计。  (5) according to step (4) established by the inertial navigation system to obtain an elliptical two-dimensional placement accuracy ECEP = (a, b), where a and b are the step (4) to establish a deviation in the longitudinal direction of the oval and lateral deviation of the axle longitudinal direction, thereby completing the placement accuracy of the estimation. 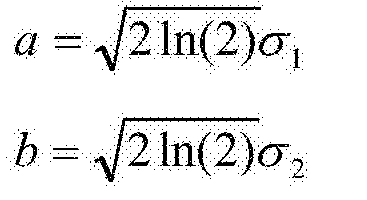 其中Θ和r分别为极坐标的参数。  wherein r and Θ are polar coordinates parameters. (3)本方法计算简便、快捷，不需要进行繁琐计算即可获得惯性导航系统性能。  (3) The method of calculation is simple, fast, does not require complicated calculation to obtain inertial navigation system performance. 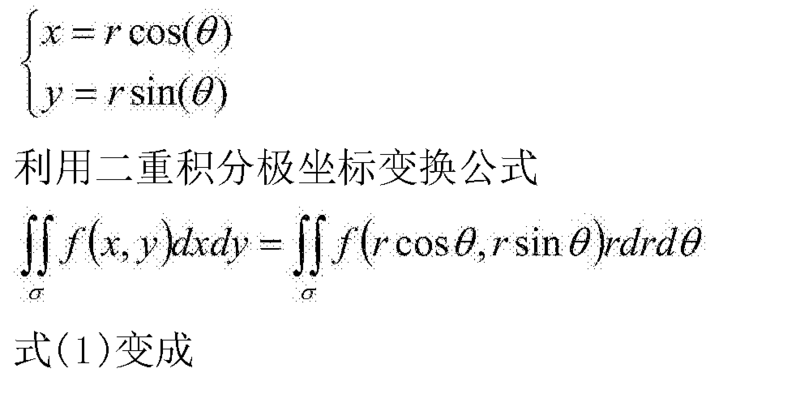 图4为模拟打靶1000次的落点分布及椭圆示意图。  Fig 4 a schematic view of an elliptical placement and distribution of 1000 analog targeting. (2)根据步骤（1)得到的位置信息，得到位置组中心的坐标，然后测量每个位置相对于位置组中心的纵向偏差和横向偏差，在此基础上通过统计计算得到η个纵向偏差的标准差〇1和11个横向偏差的标准差〇2。  (2) according to step (1) obtained position information, obtain a coordinate position of the center of the group, and each measuring position with respect to the longitudinal center of the group and the deviation of the position of lateral deviation, on the basis of a statistical calculation to obtain η the standard deviation of the standard deviation of the difference between vertical and 11 〇2 〇1 lateral deviation. 例如，经过10次试验，得到使用GPS采集得到的用经炜度表示的10个最终位置点， 通过分别对经度和炜度取平均，可以获得位置组中心的经炜度坐标，然后求取测量点与位置组中心的纵向误差和横向误差，得到η个纵向偏差和η个横向偏差，基于这两组值可以得到对应的纵向偏差标准差和横向偏差标准差。  For example, after 10 trials, obtained using GPS acquisition obtained 10 the final position of the point indicated by by Wei degrees, by separately averaging the longitude and Wei degree, by Wei of coordinates may obtain the position center of the group, and then obtaining the longitudinal and transverse error error measuring point and the center position of the group, to give deviations η and η a longitudinal lateral deviation, based on these sets of values ​​may be obtained corresponding to the standard deviation longitudinal and transversal standard deviation. (4)根据步骤(2)得到的η个运载体停止位置的纵向偏差标准差〇1和横向偏差标准差，在步骤(3)的坐标系内以原点0为中心建立一个椭圆，使该椭圆覆盖η/2个运载体停止位置。  (4) The step (2) η carrier obtained two longitudinal stop position deviation and standard deviation standard deviation 〇1 lateral deviation, in order to create an elliptical origin O as the center in the coordinate system in step (3), the elliptical coverage η / 2 op carrier stop position. 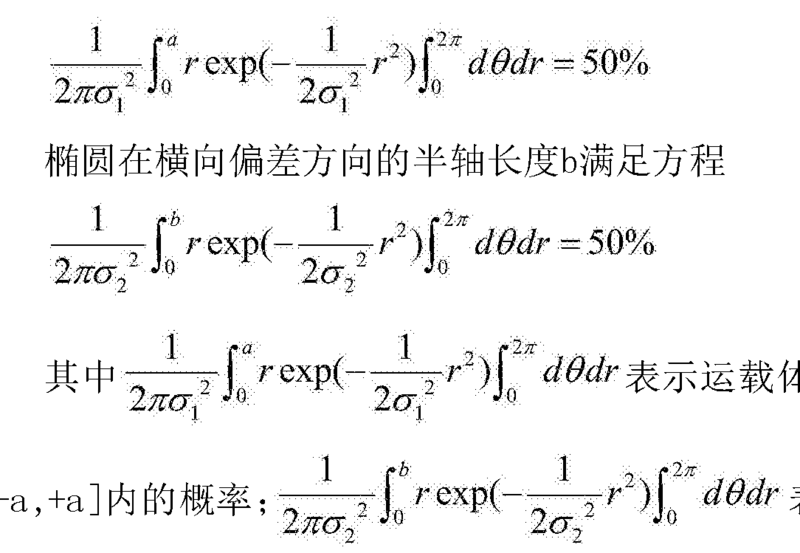 Θ和r分别为极坐标的参数。  Θ and r are the polar coordinates parameters. (5)根据步骤(4)建立的椭圆得到该惯性导航系统两维落点精度ECEP=(a，b)，其中a和b分别为步骤(4)建立的椭圆在纵向偏差方向和横向偏差方向的半轴长度。  (5) according to step (4) established by the inertial navigation system to obtain an elliptical two-dimensional placement accuracy ECEP = (a, b), where a and b are the step (4) to establish a deviation in the longitudinal direction of the oval and lateral deviation axle longitudinal direction. 本发明方法可以应用在导弹的落点精度估计中，例如，当根据本方法在某次导弹的落点精度估计中采集1000次导弹的落点位置，然后经过计算得到O 1=IOOnK02 = ^Om,根据上述方法建立坐标系0ΧΥ，使1000次导弹的落点位置的位置组中心为原点〇,纵向偏差的方向落在Y轴上，在该坐标系内建立椭圆，使该椭圆覆盖500个导弹的落点位置，所建立的椭圆的长半轴为470 · 964m，短半轴为117 · 741m，即ECEP= (470 · 964m，117 · 741m)，即，470 · 964m 为椭圆在纵向偏差方向上的半轴长度，117.741m为椭圆在横向偏差方向上的半轴长度。  The method of the present invention can be applied in the estimation accuracy of the missile impact point, e.g., when the landing position acquired in 1000 missile missile impact point accuracy of a particular estimation according to the present method, and then calculated to give O 1 = IOOnK02 = ^ Om, 0ΧΥ coordinate system is established according to the above method, so that the center of the impact point 1000 position set as an origin position of the square of the missile, the deviation of the direction of the longitudinal axis Y falls, within the established coordinate system in the ellipse, the ellipse so covered 500 missile impact position, established semi-major axis of the ellipse 470 · 964m, semi-minor axis of 117 · 741m, i.e. ECEP = (470 · 964m, 117 · 741m), i.e., 470 · 964m elliptical in axle length in the longitudinal direction of deviation, 117.741m longitudinal axle of the ellipse in the transverse direction of the deviation. 模拟打靶1000次的落点分布如图4所示，图4中同时加入了利用CEP进行评估的结果和利用本发明方法(椭圆）进行评估的结果。 Analog 1000 targeting the impact point distribution shown in Figure 4, while in FIG. 4 the results using the CEP added and evaluated using the method of the present invention, (ellipse) evaluation results. 从图4中可以看出，用椭圆来描述落点分布相对精确，而CEP评估结果并不能准确描述落点特征。 As can be seen from Figure 4, will be described with elliptical distribution is relatively accurate placement, while the CEP evaluation results do not accurately describe the placement of features. 本发明未详细描述内容为本领域技术人员公知技术。  SUMMARY The present invention is not described in detail to those skilled in the known art. 求解后得到其中Θ和r分别为极坐标的参鉍； (5) 根据步骤(4)建立的椭圆得到该惯性导航系统两维落点精度ECEP=(a，b)，其中a和b分别为步骤(4)建立的椭圆在纵向偏差方向和横向偏差方向的半轴长度，从而完成落点精度估计。 Solving the obtained wherein r and Θ are polar coordinates of the reference bismuth; (5) according to step (4) established by the inertial navigation system to obtain an elliptical two-dimensional placement accuracy ECEP = (a, b), where a and b are step (4) to establish a deviation ellipse longitudinal direction of the axle longitudinal and transversal directions, thereby completing the placement accuracy of the estimation.